The other day I was walking down Limuru Road without sense or purpose, as you do when you are unemployed. In my company was Amazing Woman Number 7 (AW7) who is a student at the University of Nairobi and is therefore almost as idle and definitely more economically challenged than I am. Off we went on our dusty, leisurely stroll. We walked past the flower vendors’ wares – mountains of sand, molehills of manure, a variety of flowering plants in black plastic bags, tired-looking swan-shaped flower pots, large colourful pots – all for sale, and all spread out over two hundred metres of what may or may not be part of the pedestrian path. We passed the lonely, faded-green pedestrians’ flyover, which seems to be resigned to the fact that its intended users will continue to treat it with disdain (they prefer instead, to run across the road) and that its caretakers, the Nairobi County government, have forsaken it. If that footbridge was human it would be a poorly-dressed middle-aged drunk; a loyal civil servant who was forced to take an early retirement. Past the dejected footbridge and right after the Hawkers’ Market lies City Park, which at age 89 is almost four decades older than independent Kenya and perhaps deserves to be treated with more respect than it’s been shown over the years. According to its friends, City Park spreads over 60 hectares and is the only park in the city with an indigenous forest. Besides the highland forest, the park is home to various historical sites including World War I and II veterans’ cemeteries, botanic gardens, almost 1,000 species of flora and fauna, and most importantly, monkeys. When it was formed in 1925 the park measured 91 hectares but over the years, some industrious Kenyans decided that the public did not have much use for green spaces and they appropriated tens of hectares of the land. Some have stated that in recent years more sections of the park have been encroached upon by private developers and that the park now only consists of 19 hectares of land. 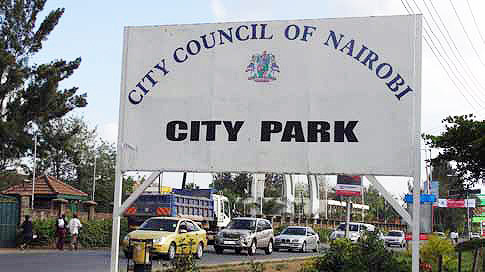 Friends of City Park have actively fought against land-grabbing and the Aga Khan Trust for Culture recently threatened to stall its plans to invest $20 million into the park’s rehabilitation until the land-grabbing issue is resolved by the government. I had not been to City Park before, but I had heard a lot about the mystical monkeys that reside within. As AW7 and I walked into the park, I wondered about the monkeys’ famed magical powers. Can they heal all manner of psychological disorders? Do they levitate while meditating? Do they sit around a fire and tell the park’s visitors tales of times past? Suffice it to say, I was looking forward to going into the park’s interior and meeting the monkeys. As fate would have it, though, we stumbled upon a football match taking place on one of the fields near the park’s entrance. The teams, while enthusiastic, fully staffed and well kitted, were working in poor conditions. The field – vast and dry – was littered with sweet wrappers, empty peanut packets, green and red scratch cards, banana peels and all manner of rubbish that spoke of the general population’s troublesome relationship with dustbins. Where grass grew, it was in dry, green-brown tufts that resembled the last bits of hair on a balding man’s head. The goal posts were so small, it was unclear whether the football pitch was intended for use by anyone over the age of six. Worst of all, there were no spectators. And so, because we are community service-oriented individuals (certainly not because it was hot and we were too lazy to walk the park’s 60 or 19 hectares) we decided to take a detour and watch the game. What, after all, is a football match without spectators? “Mu-ghe-mbo, mu-ghe-mbo!” one of the players called out in that French accent that some women find irresistible. It was completely wasted on AW7. Which can be loosely translated to mean: I’m not impressed. Also: what in heaven’s name are you saying? AW7, bless her, is a young lady of virtue, intelligence and many talents but tact is not her strongest points. It took me some minutes to work out what he was saying (mrembo) and that this term of endearment was directed at AW7; because let’s face it, I may be gifted but I’m no beauty. 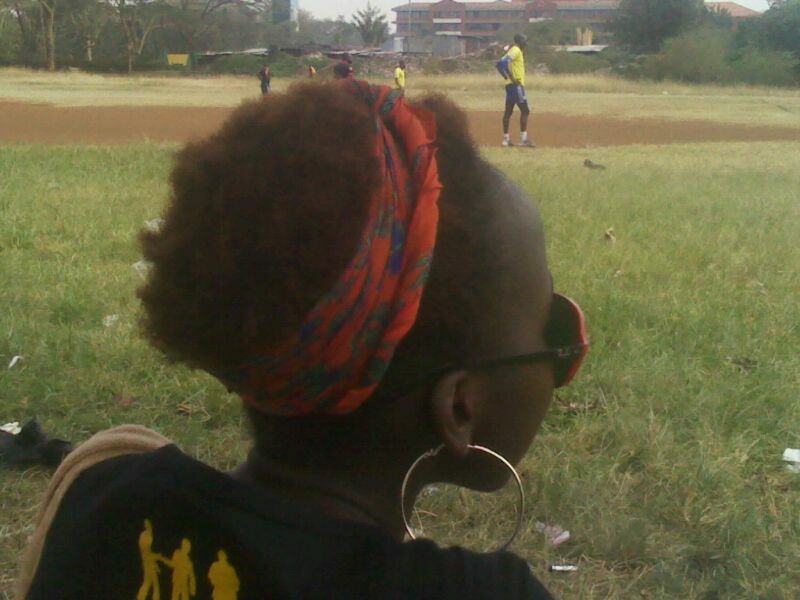 We waved to the player and his colleagues, who by now had stopped playing to appreciate the mrembo, walked to the bottom end of the field and sat under one of the trees. Under the adjacent tree was a man who was lying on his stomach and snoring contentedly. Next to him a monkey sat cross-legged, chewing popcorn thoughtfully and watching the players. Around its neck was thick black thread from which a whistle dangled. I wondered if the monkey coached one of the teams. Both teams clearly took diversity seriously: there were men of varied ages, heights, body-sizes, and crucially, hairstyles. There were tall dread-locked men, stout balding middle-aged men, and men in fro-hawks that were more outstanding than Paul Pogba’s. Some were running easily, some were huffing and puffing, some were standing around with hands akimbo, and all were shouting to each other in rapid French. The only thing they didn’t seem to have gotten right was geographical representation: as far as I could tell, they were all from West Africa. Who were these men? Did they live in Nairobi? What did they do that allowed them time off to play football on a Wednesday mid-morning? I needed some answers. During half-time AW7 remembered that she had a class that afternoon and so our day of leisure was cut short. One of her admirers saw us get up and came over to talk to us. Unfortunately, he was more interested in badgering AW7 for her mobile number than he was in answering my questions. I did manage to get one response from him though: the group plays football in City Park twice a week. 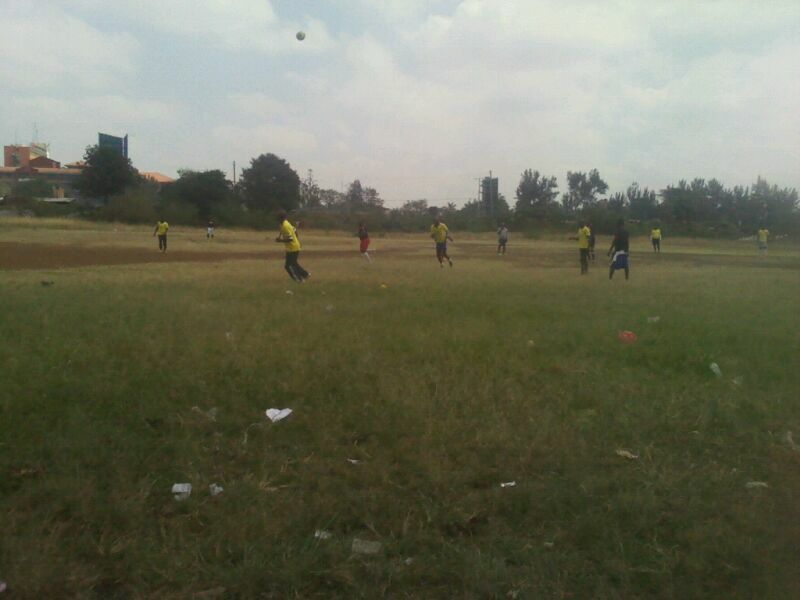 It can therefore be safely assumed the players live in Nairobi. I will return to City Park soon: to see the rest of the park, to interview the West African footballers, to witness the monkeys’ incredible powers and to help Friends of City Park clean up. 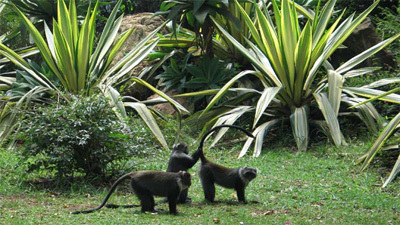 For more information about City Park and its monkeys, check out the Friends of City Park website. © Lost in Nairobi, 2014. Unauthorized use and/or duplication of this material without express and written permission from this blog’s author and/or owner, and from authors of individual posts (if different from blog's owner) is strictly prohibited. Excerpts and links may be used, provided that full and clear credit is given to Lost in Nairobi and the authors of articles therein with appropriate and specific direction to the original content.